Joyner Library is at the heart of the ECU campus. In addition to serving the students at ECU, it offers services to the public and served over a million visitors during the 2015-2016 academic year. As a student at East Carolina University, you enter Joyner library in one of two ways - enter directly by the main entrance across from the water wall or here, through the bell playing columns. This entrance is another favorite location of seniors, somewhat of a right of passage type shot. The steps and columns make great props, it is the lack of anything behind the senior that makes the shot. Standing at the bottom of the steps, I placed a flash slightly to left of the camera aimed at my college senior and balanced the flash by underexposing the background by roughly 1 stop. Once the background was fairly clear of people, I had her softly blow air into her hands, making the tiny glitter fly in front of her face. The flash, in addition to illuminating her, also lit the glitter, giving the sparkle needed to make the shot perfect. I get asked a lot about the key to doing this shot. One of the things that has to be controlled is how much air is blown into glitter. I have my seniors hold their hands out flat with a slight curve upwards of the fingers, which forces the glitter to fly up and out. Also, don't let them puff their cheeks out. You want a quick but solid burst of air into the hands. Lastly, and most importantly, they have to maintain eye contact. The shot's just not the same if they close their eyes when they blow or if they are looking down at their hands or the glitter. 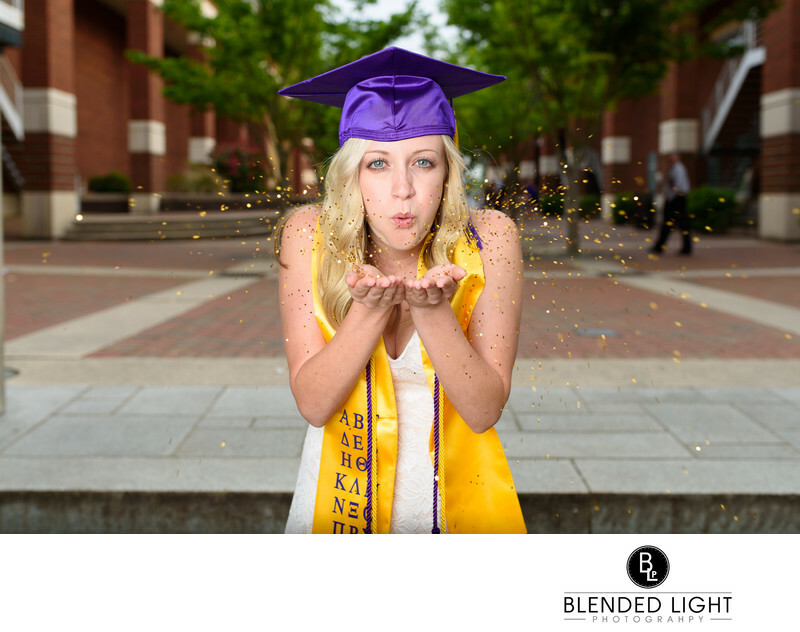 These simple but fun shots help create the memorable images from a senior session on any of North Carolina's college or high school campuses. I love working with college and high school seniors and would love to add you to my growing list of overly satisfied graduates! Reach out and let's chat about what you are looking for! 1/250; f/3.5; ISO 50; 35.0 mm.